If Chance is now greater than 100%, then Chance is halved and Duration is doubled. This is repeated until Chance is less than 100%. Duration remains at 2 turns. If you have the armour and shield equipped, then the pet deals +10% damage in Normal Attack mode and the Daze becomes 21.85*[IceResist]%. ***Click to have your Ice Cream Golem attempt to Daze foes! ***Your Ice Cream Golem will attempt to Daze your foe! **†Click to have your Ice Cream Golem focus on damage! 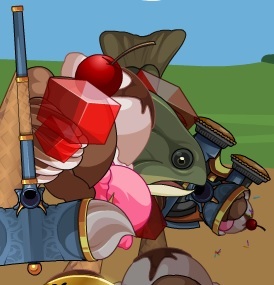 *††Your Ice Cream Golem will focus on purely damaging your foe! **‡The overload of cold dessert has dazed your foe! *‡‡Your foe gets a mild headache from the cold dessert, but they shake it off. ‡‡‡Those immune to Ice are also immune to the Dazing effects of this attack. This cool customer will follow your lead to either hit for power or to leave your opponent reeling. Numbers thanks to Kaelin and Kamui. Description and popups thanks to Syth. Normal Attack: Deals +5% damage. Daze Attack: Deals -50% damage to pay for the effect. With two equally powerful hits, each hit does *1/2 damage. MC: Deals +5% damage in Normal Attack mode (already shown above). In Daze mode, the MC is used to reduce the damage penalty. September 3, 2016: The pet was released. September 9, 2016: Lvl. 105+ tiers released.